The St. Louis Cardinals entered Great American Ballpark tonight with a three game lead over the rival Cincinnati Reds in the National League Central. With staff ace, Adam Wainwright, on the mound, the team was confident in their chances of extending their lead to four games. That is exactly what they did–winning the game 9-2. 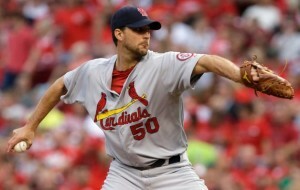 Wainwright competed well tonight against the division rival. He was able to scatter seven hits over seven innings while allowing just two earned runs. He compiled seven strikeouts to just one walk–improving his strikeout-to-walk ratio to an impressive 13:1 mark. The offense backed up the gutty performance by their ace with plenty of runs. Third baseman, David Freese, was able to extend his career high, MLB leading hitting streak to 17 games. Following right behind him, lead-off man, Matt Carpenter, extended his own hitting streak to 16 games. Pete Kozma and Jon Jay were able to break out of their lengthy slumps and have two hits a piece. Kozma had a double and three RBI, and Jay had a double and two RBI. They will look to build on their successful plate appearances tonight to get their bats going for the rest of the season. Thus, Wainwright was able to notch his ninth win of the season while expanding the Cardinals lead to four games over the Reds–the team’s biggest of the season. St. Louis was able to improve the major leagues’ best record to 40-21. The Cardinals have now won the last four series against the Reds and look to make it a fifth by winning tomorrow’s game between Tyler Lyons and Mat Latos.